marketplace known as the Gore Capabilities Center. 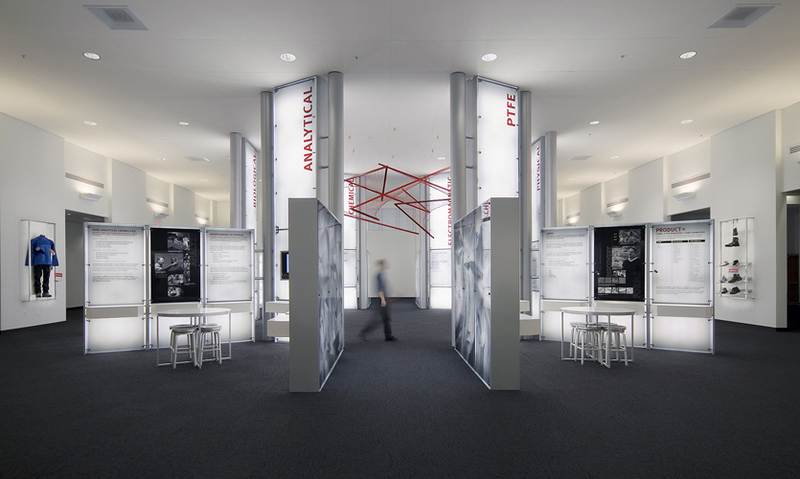 A two-year collaboration with the project architects facilitated the integration of the exhibit space with the architectural space. The goal was to communicate and celebrate the technical breadth and range of capabilities of PTFE, Gore’s signature product. 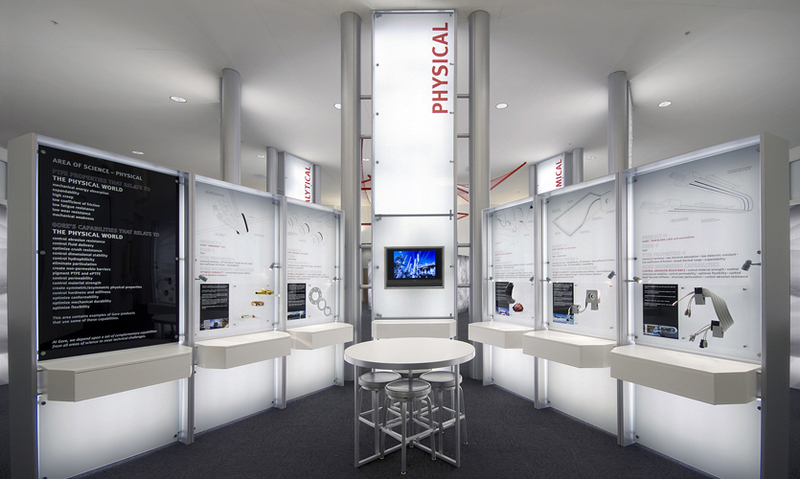 Not just a product showcase, the center needed to make complex, largely abstract scientific information accessible to a wide range of visitors, from existing and potential Gore clients to associates, the media, and potential employees. 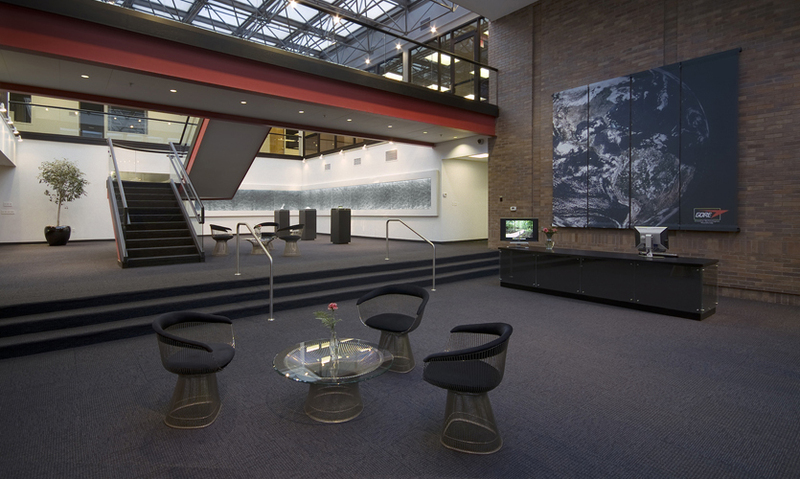 Once inside the Gore headquarters, visitors are welcomed to an elevated lobby space that brings the origins of PTFE to life. 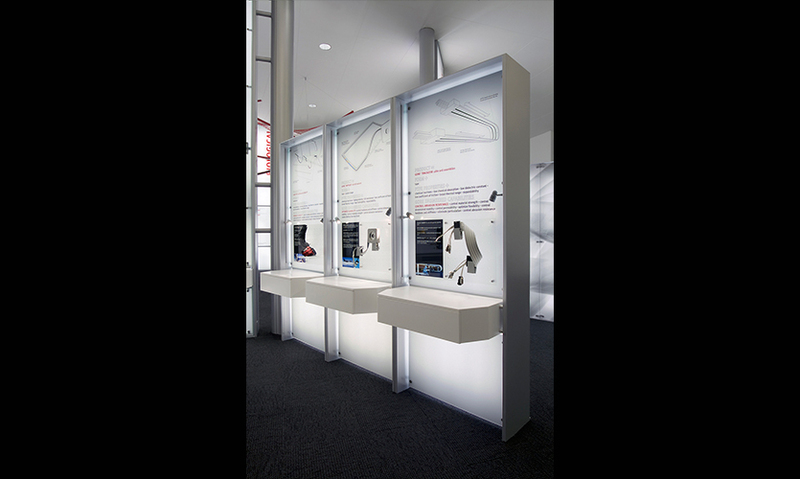 Three large glass vitrines atop dramatic plinths draw visitors into the space. The vitrines encase a large, glowing green crystal of fluorspar ore, a conical mound of PTFE fine powder, and a flowing membrane of expanded PTFE. 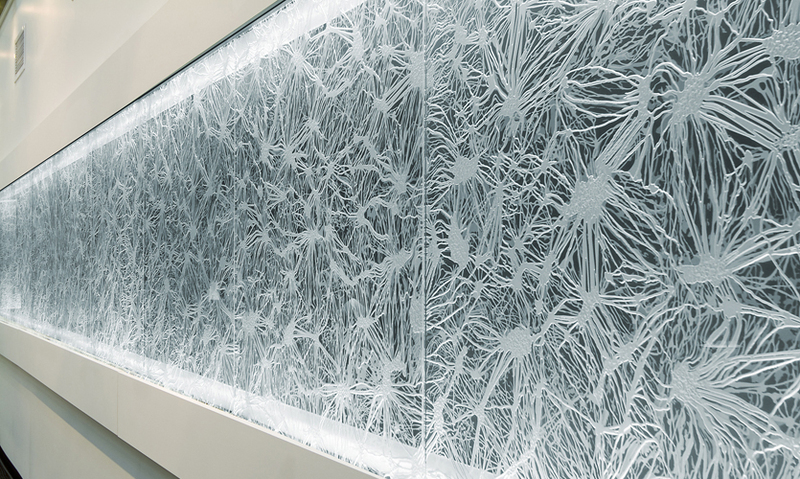 Embracing the area on two sides is a 33- by 40-ft. display that looks like a dramatic piece of abstract art, but is actually an etched, carved, and edgelit glass depiction of the micro-fiber structure of GORE-TEX. Inside the Capabilities Center, the Gore story is told in six parts; the number six and the hexagonal form are core elements in the space. 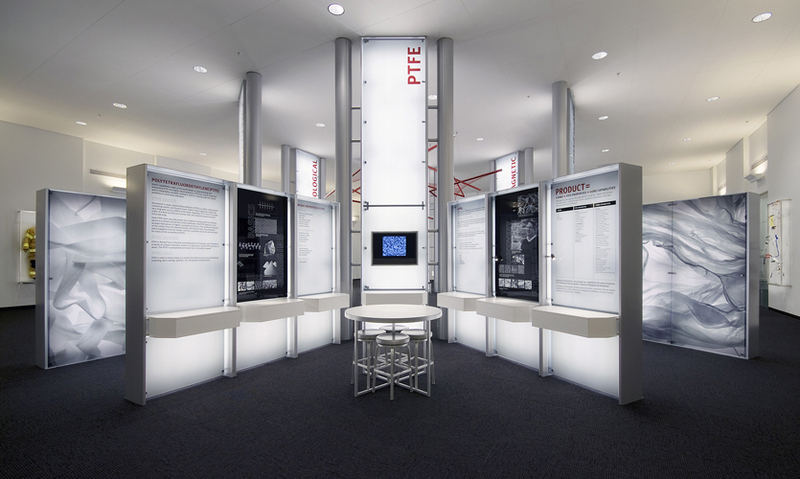 From the center of the room, six exhibit modules radiate, each containing six panels that introduce an area of science that Gore is involved in and provide examples of relevant Gore products. Long fin walls feature macroscopic views of the various forms of PTFE. 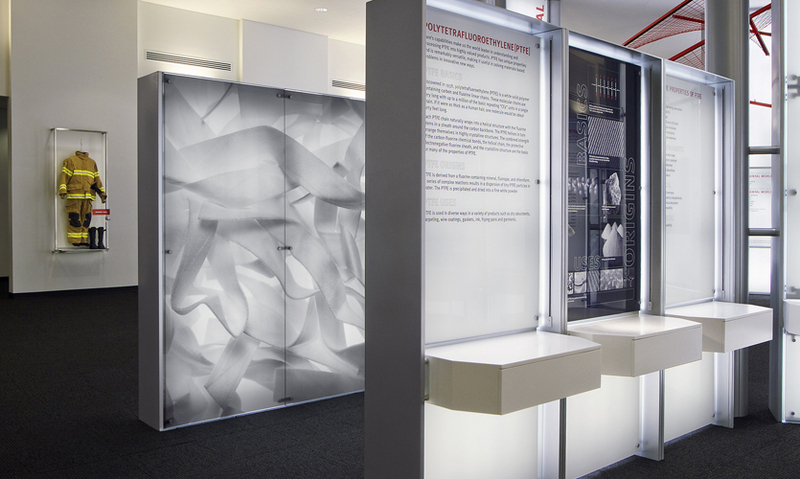 Overhead, a centerpiece sculpture made of GORE Tenara® fabric suggests the complex geometry of the basic PTFE molecule. Carbone Smolan used a palette of powdercoated steel and aluminum, Lexan, and glass to create a laboratory feel appropriate for the high-tech client. 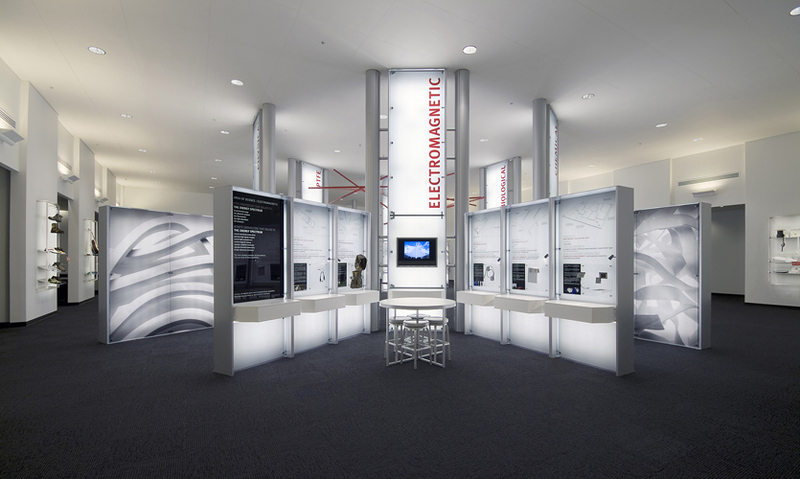 The exhibit also uses Gore’s corporate colors of white, black, and silver accented with small amounts of red.